Most swimming pool packages include standard features, but there are a few additional options most Indiana buyers select, because they are very functional or just fun! Indiana law mandates that pool owners have a cover or a fence around a pool (or yard) for safety. Auto covers are generally favored, because they can be applied with the push of a button (or turn of a key). Adults can relax if they have to leave the home—children can be essentially locked out of the pool. A fence, on the other hand, only protects your yard from intruders. One of the things you will love most about an auto cover is the protection it provides from debris. Without a barrier, you may have to spend a great deal of time cleaning your pool—especially if you have cottonwood trees or other plant life that drops leaves, seeds and other items into the water. The great thing about auto covers is that they protect both fiberglass and vinyl liner pools without ruining the aesthetic; tracks guiding the cover can be built in such a way that they are invisible. Expect to pay $8,000 - $11,000 for an auto cover depending on options, especially track options. Nighttime lounging by the pool can take on a completely different feel with colored lights, one of the most inexpensive ways to add style. 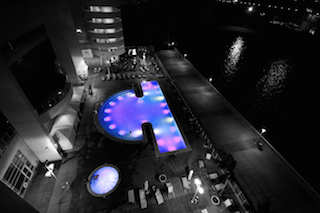 Fiberglass and vinyl liner pool packages generally come with a light, but you may want to create a multi-color effect with two LED lights and even synchronize them for different patterns. These lights can run for thousands of hours, so the investment is very worthwhile. Expect to pay less than $1,000. Whether your pool has a simple or creative design, water features can add a powerful aesthetic. And they are great fun. Kids love the unexpected surge of water from deck jets (and it’s a nice way to cool down a hot pool). The more classical water features, including rain archs, cascades and pots with spillways, elegantly turn your pool into an interactive fountain. Some pool owners build adjacent ponds and waterfalls for a nature effect. So many options are possible; water features can be simple to add, pretty to look at and soothing to listen to. For stock water features, expect to pay less than $2,000. For custom water features, expect to pay more! 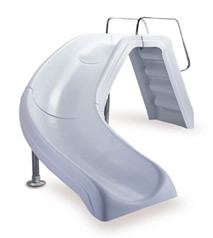 Slides are a big hit with kids, and they provide a lot of family fun. A slide may be a great option given the design of your pool—especially if you don’t have the space, depth or interest in a diving board. There are 4’ and 6’ slides in blue, white, tan and gray. Depending on the slide size and style, you may need a deck that ranges from 8’ x 4’ to 14’ x 8’. Positioning could affect the amount of deck space required. Check out all the slides on the Internet. For installed prices, expect to pay $2,200 - $4,500 for standard slides. A good pool builder coordinates various features and options as they develop plans for your pool. So you’ll want to discuss all of your ideas, the essentials and the extras, as you define pool type, size and shape. This way, the appropriate space and dimensions can be built into your pool and deck. Want to learn more about the various features and options that come with your pool? Download our pool buyer’s guide.